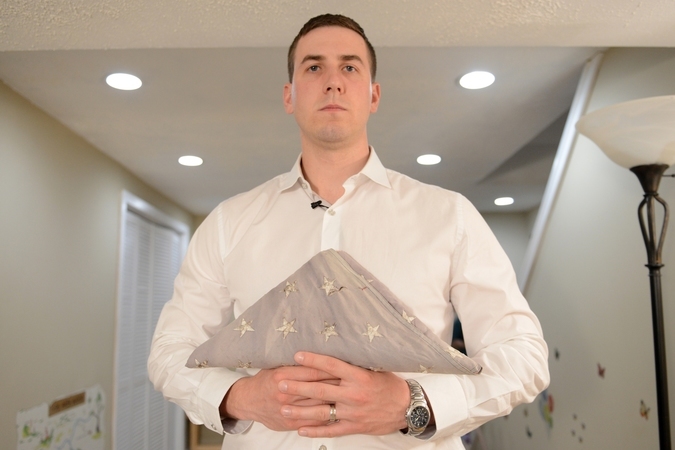 Since receiving the Medal of Honor in July, former Army Staff Sergeant Ryan Pitts has shared his story in front of audiences from Washington, D.C., to Italy. He rang the closing bell at the New York Stock Exchange and chatted with David Letterman about his actions during the Battle of Wanat, for which he received the nation’s highest award for valor. He’s had an opportunity to speak most of these occasions and, without exception, he’s used each one to talk about the nine soldiers who died fighting alongside him on July 13, 2008. His interview with On Patrol was no different. Pitts, who was seriously wounded by shrapnel and unable to stand during the Battle of Wanat, is credited with preventing hundreds of enemy fighters from overrunning a small observation post in eastern Afghanistan. He says the medal is not his alone and that it represents a team effort to defend the post. The medal also serves a memorial to the men who didn’t come home—men Pitts considers brothers. “He came in partway through the deployment and … it’s always tough to be the new guy, but he was accepted quickly and I think he endeared himself to the guys. He was really likeable and could relate to the guys – he was just one of us. “He was new. He came in after we got back from my first deployment in 2006. I got to know him better over the course of the deployment. … He had a wife, Lesly, and was always just a real happy guy. Garcia was always in a good mood, always smiling, with an infectious [personality]. You know, just real easygoing … a relaxed guy. “I didn’t know Abad very well. What I do know about him is that he came over from Korengal Valley – he had been with Battle Company – and he came over to join us. … He was a mortarman [and] he was very good at his job. He was a young guy and for him to be as proficient as he was, that was impressive. "I heard this recently: His squad leader helped [Sergio] get married while he was deployed to Afghanistan. My buddy was a squad leader who took care of that and Sergio wanted to get married . His fiancée was pregnant with their daughter and my buddy looked up online and found the one state – I think it was Nebraska – that would allow people to be married over the phone. And I think that’s how they got married. That’s the way I remember that story. “Ayers was a real quiet, even-keeled, subdued guy. I had been on guard with him [countless] times and I can’t even remember everything that we talked about just because he was so low key. But he was real steady. He never complained and you could always count on him to do whatever he needed to do. “He was the funniest guy in the platoon. … And he made fun of himself just as much as he made fun of everybody else. Everybody loved him. He was deeply religious and his faith was very important to him. "He was a pretty fit guy – and he had gotten Arnold Schwarzenegger’s book on weightlifting a long time ago and he would do Arnold impersonations all the time. “He grew up wrestling and loved it. I think he wrestled for the one year that he went to college and was pretty good at it. I was into Jujitsu when I was over there and he and I fought a couple of times and he was good. He wasn’t afraid. He’d fight anybody. He didn’t care, even if he was going to lose, he wouldn’t back down. “He was one of the youngest in the platoon. All these guys are characters – really funny guys and everybody loved them, infectious smiles, really happy – he was just great to be around. He wasn’t physically a big guy but he could carry his weight and we all trusted him and he could be counted on.